Academician Pashin medium-sized tanker is being built for the Russian Navy as part of Project 20130. Image courtesy of Nevsky Shipyard. The keel laying ceremony was held in April. Image courtesy of Nevsky Shipyard. First-steel being cut for the new replenishment oil tanker at Nevsky Shipyard. Image courtesy of Nevsky Shipyard. Academician Pashin is a replenishment oil tanker being built for the Russian Navy as part of Project 23130. On completion, it will be the first oil tanker built for the Russian Navy since the downfall of the Soviet Union. The keel laying ceremony for the first medium-sized sea tanker under Project 23130 was held in April at Nevsky shipyard (Leningrad region), a subsidiary of JSC North-Western Shipping Company, in Schlüsselburg. It was launched in May 2016. The total cost of the ship is estimated to be RUR3.08bn (approximately $85m). The Damen Double Hull Oil Tanker 8000 type oil tankers are built by Damen Shipyards. The construction of the sea tanker was accomplished according to detailed specifications mentioned in the state contract, which was signed in November 2013, with the Ministry of Defence of the Russian Federation, represented by the Federal Agency for Weaponry, Military and Special Equipment and Material facilities Procurement (Rosoboronpostavka). Project 20130 is being developed by Spetssudoproect, JSC. In February, the shipyard announced a tender for materials and equipment such as a bow thruster, propulsion plant, cargo pumps, auxiliary diesel-generators, steering gear and compressors. The medium-sized tanker, Academician Pashin incorporates a steel hull with Arc 4 class ice strengthening. The ship has an overall length of 130m, a breadth of 21m, a maximum draught of 7m, and deadweight of 9,000t at maximum draught. The displacement of the ship will be approximately 14,000t. The vessel will be outfitted and equipped for year-round operations, and will independently sail without limitation in area according to the rules specified in the Russian Maritime Register of Shipping. The replenishment tanker, which will sail to a maximum range of approximately 8,000 nautical miles, is designed to sail at a speed of 16k and offer an endurance of 60 days. Academician Pashin will provide logistical and replenishment support at sea to the Russian Navy’s fleet of ships, including surface ships and submarines. The tanker will be outfitted to provide accommodation for up to 24 crew members. The tanker will carry diesel fuel, fuel oil, aviation fuel, motor oil and water, besides food and dry cargo, and can conduct replenishment at sea (RAS) missions with other ships. "The replenishment tanker is designed to sail at a speed of 16k and offer an endurance of 60 days." 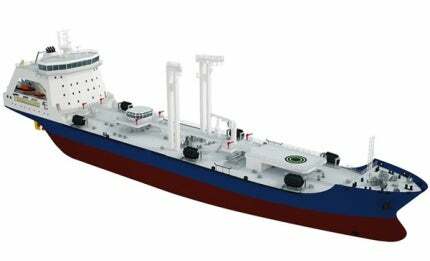 The medium-sized fleet tanker will be fitted with on-board storage tanks with a capacity to hold 3,000t of fuel oil, 2,500t of diesel fuel, 500t of aviation fuel, 150t of lubricating oil, and 1,000t of fresh water. In addition to fuel storage, the vessel will be outfitted to carry 100t of dry cargo such as food and spare parts. The replenishment ship is equipped with a single-shaft propulsion system powered by diesel engines, and a bow thruster will provide manoeuvrability in narrow canals and waterways. The vessel will also be fitted with mechanical automation systems for ensuring safety and reducing the workload of the crew. Roodhart Marine Services supplies spare parts for marine equipment. It stocks pieces for pumps, compressors, seperators and diesel engines. It can also recondition rotating equipment and supply a complete range of mechanical seals from its Rotterdam warehouse. These can be distributed from the company's offices in the UK or the US to ensure a speedy installation.